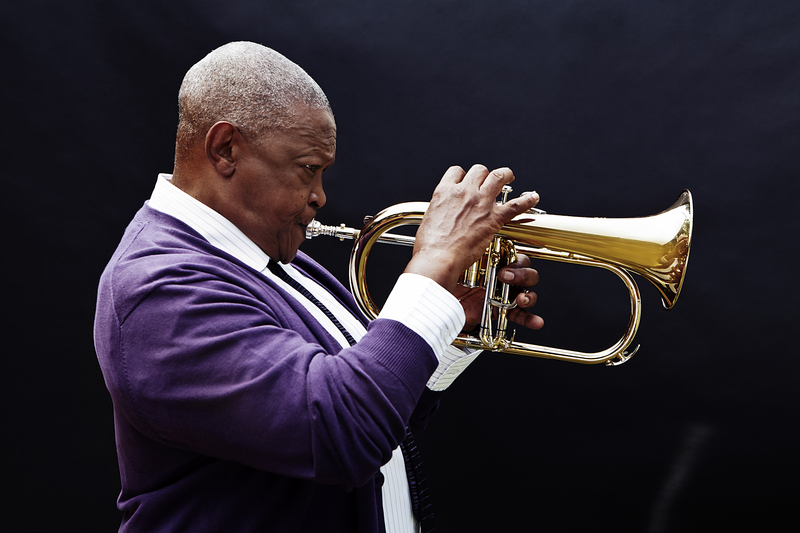 Through this partnership, Manhattan School of Music will provide full scholarships to six South African music students enabling them to pursue Bachelor of Music degrees at MSM, Hugh Masekela’s alma mater. 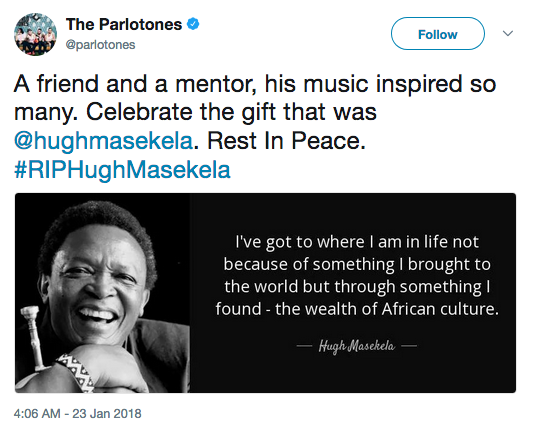 April 3 2019, Johannesburg – On the occasion of what would have been his 80th birthday, the Manhattan School of Music (MSM) and The ELMA Music Foundation, in partnership with the Hugh Masekela Heritage Foundation, will, on April 4th, announce the establishment of the Hugh Masekela Heritage Scholarship at MSM in honor of the legendary South African musician, activist and life-long advocate, and embodiment, of African identity, heritage and expression. 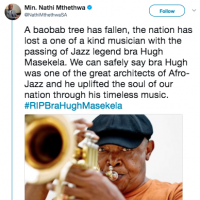 From his birth to his passing Hugh Masekela’s most ardent passion was the restoration, promotion and evolution of African identity, heritage and culture. 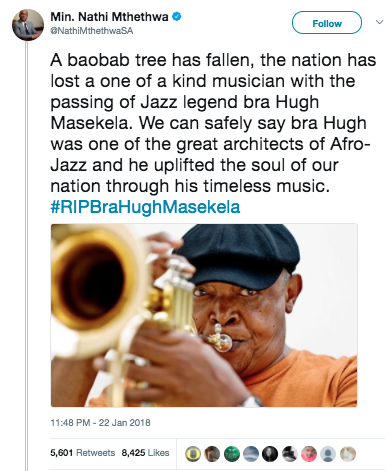 The Hugh Masekela Heritage Foundation is an expression of that passion, that legacy, through the creation of cultural information facilities, the support and incubation of heritage arts, and the dissemination of this information and cultural inheritance throughout the African Diaspora and the world. The Foundation’s specific focus is in the areas of African History and Languages, Genealogy, Inter-generational Communication, Music, Dance, Theatre, Literature, Visual and Culinary Arts. Born in the small mining town of Witbank, South Africa on April 4, 1939, Hugh Ramapolo Masekela was “bewitched” by music at an early age. 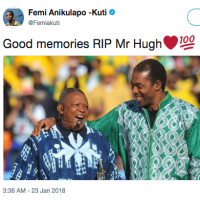 Convinced that the musicians were contained in his uncle Putu’s 78rpm gramophone, Hugh took piano lessons at 5, received his first trumpet in 1954, and more famously, a week after his seventeenth birthday, received a trumpet from Louis Armstrong. Apprenticing his way through the South African music scene from the Father Huddleston Jazz Band, to playing as sideman in many of the great bands of the day, becoming bandleader of Alfred Herbert’s famed African Jazz & Variety, copyist (with trombonist Jonas Gwangwa), and trumpeter with the groundbreaking South African jazz opera King Kong; trumpeter, along with revered South African alto saxophonist Kippie Moeketsi and Jonas Gwangwa, on American jazz pianist’s Johnny Mehegan’s South African Gallo sides Jazz In Africa (volumes 1 & 2), and later, with Kippie Moeketsi, Jonas Gwangwa and Abdullah Ibrahim (then Dollar Brand), Johnny Gertze and Makhaya Ntshoko, forming and recording South Africa’s first all-African bebop band The Jazz Epistles – Jazz Epistle: Verse 1. Championed by Yehudi Menuhin, Johnny Dankworth, Johnny Mehegan, Harry Belafonte, and Miriam Makeba Hugh Masekela began his schooling at MSM in September of 1960. It was at MSM that Hugh would form lifelong musical, and familial, bonds with fellow MSM students Stewart Levine and Larry Willis. Marked by the kaleidoscopic template established during his South African apprenticeship Masekela’s recording and performance career are imbued with a tapestry of diasporic African musical heritage, traditional South African music, Jazz, Brazil, Spanish Latin America, R&B, Motown, Mbaqanga, Rock & Soul, Afrobeat, and musical theatre. Beginning with the West Coast success of the East Coast live recording The Americanization Of Ooga-Booga, Hugh variously performed at the first Watts Jazz Festival, featured on The Byrds “So You Want To Be A Rock ‘n’ Roll Star”, featured at the 1967 Monterey Pop Festival, established, with Stewart Levine, Chisa, a music production house that featured the talents of The Crusaders, Letta Mbulu, Monk Montgomery, Stu Gardner, Peter Fonda and Gram Parsons; recorded the million-seller LP The Promise Of A Future, which featured the chart-topping mbaqanga tune “Grazing In The Grass”. In 1973 Masekela embarked on an African cultural excursion that included organizing the Zaire ’74 musical festival meant to accompany the Rumble In The Jungle, performing at various African state fund and consciousness-raising events including FESTAC ’77, composing and producing Miriam Makeba, most prominently her 1978 Country Girl LP release, and producing 6 seminal works, in a unique musical idiom that would long be featured in his performance including, ‘Ashiko’, ‘Languta’, ‘In The Marketplace’, ‘Rekpete’, ‘The Boy’s Doin’ It’, and the audience anthem ‘Stimela’. Ever the creator in motion, the late 70’s would find Hugh teaming with Herb Alpert to produce their self-titled Herb Alpert/Hugh Masekela and Main Event Live. December 1980 would find Masekela performing a Christmas concert in Lesotho with Miriam Makeba. Recorded in Botswana in 1984, using a mobile recording studio, Techno-Bush would find Masekela back in the US dance charts with ‘Don’t Go Lose It, Baby’, held out of the top spot by Prince’s ‘When Doves Cry’. 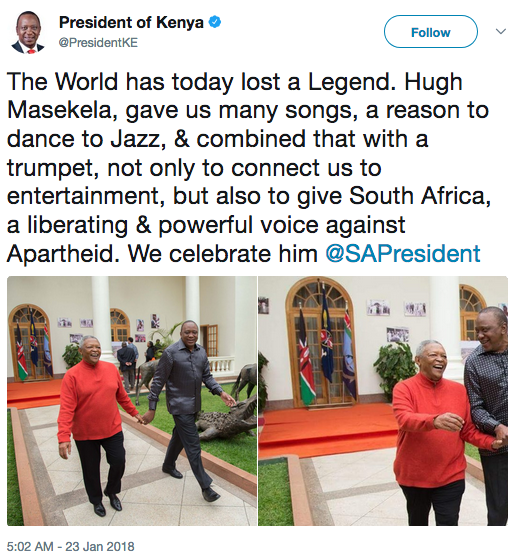 1987 found a London-based Hugh Masekela recording Tomorrow which featured the Mandela-inspired anthem ‘Bring Him Back Home’, in the heat of the worldwide Anti-Apartheid movement. 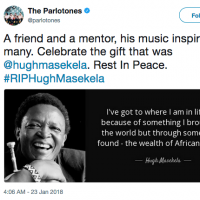 1987 also found Hugh Masekela, along with Ladysmith Black Mambazo and Miriam Makeba as featured players on the triumphant global Paul Simon Graceland Tour. Following the first leg of Graceland Tour, Masekela was a seminal contributor to the music of Mbongeni Ngema’s Sarafina! including it’s titular song, inspiration for the character. In September of 1990 he returned to South Africa, after thirty long years, whereupon he embarked on the countrywide homecoming Sekunjalo tour. 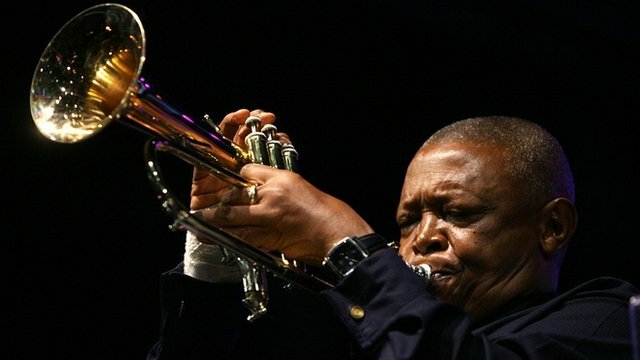 As a now local South African artist Hugh Masekela found success with songs like ‘Chileshe’, ‘Thanayi’, and ‘Send Me (Thuma Mina)’ as well as theatre productions like Songs Of Migration. 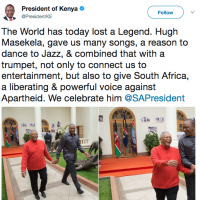 As a working musician Masekela continued to perform at various local festivals, on the African continent, and throughout the global music circuit including the US, the UK, Brazil and Japan. It would be impossible include the breadth of Masekela collaborative partners and recordings credited and uncredited, although some of these would include Stewart Levine, Larry Willis, Randy Crawford, Ivan Lins, Bob Marley, Fela Kuti, Miriam Makeba, Baobab Singers and Dave Grusin. 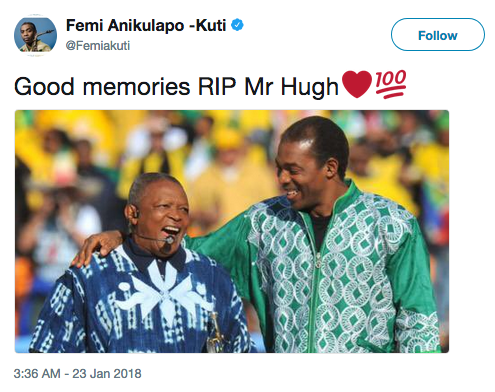 Beloved the world-over from Stockholm to Senegal, Hugh Masekela passed on from this life on January 23, 2018. Founded as a community music school by Janet Daniels Schenck in 1918, today MSM is recognized for its more than 960 superbly talented undergraduate and graduate students who come from more than 45 countries and nearly all 50 states; its innovative curricula and world-renowned artist-teacher faculty that includes musicians from the New York Philharmonic, the Met Orchestra, and the top ranks of the jazz and Broadway communities; and a distinguished community of accomplished, award-winning alumni working at the highest levels of the musical, educational, cultural, and professional worlds. The School is dedicated to the personal, artistic, and intellectual development of aspiring musicians, from its Precollege students through those pursuing doctoral studies. Offering classical, jazz, and musical theatre training, MSM grants a range of undergraduate and graduate degrees. True to MSM’s origins as a music school for children, the Precollege program continues to offer superior music instruction to 475 young musicians between the ages of 5 and 18. The School also serves some 2,000 New York City schoolchildren through its Arts-in-Education Program, and another 2,000 students through its critically acclaimed Distance Learning Program. The ELMA Music Foundation invests in organizations that use music to improve youth outcomes in the United States. The ELMA Music Foundation has four principle focus area – Music and Youth Development, In-School Music Programs, Music in Early Childhood Development, and Music and Opportunity Youth. Grantees include The Mama Foundation for the Arts, a cohort of community-based organizations that form The Music and Youth Development Alliance, the GRAMMY Music Education Coalition, Harlem Children’s Zone, Mind Builders Creative Arts Center, and Creative Solutions.